Mrs Sunderland was a soloist in the Huddersfield Choral Society. She sang for royalty and Queen Victoria is alleged to have said to her “I am Queen of England but you are Queen of Song”. On her golden wedding a special concert was given and the proceeds were used to set up the Mrs Sunderland Musical Competition. This competition is held in Huddersfield every year and hundreds of artists take part. At the end of the week of competitions a concert of winners takes place in Huddersfield Town Hall. Celebrating the success of Huddersfield Town Football Club. This Huddersfield nameplate was on a railway engine of the London & North Eastern Railway Company. The locomotive was of the Sandringham class 4-6-0 61653 and was built in Darlington in April 1936. You would have been unlikely to have seen this locally as these locomotives were used to pull trains in the East Anglia Region. This is part of a collection of railway items from the Huddersfield Railway Circle. The Jaquard Loom was introduced into many of our local mills. 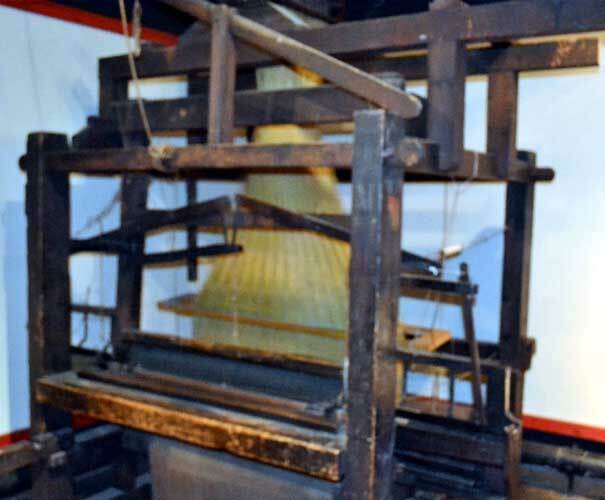 This piece of machinery was invented by a Frenchman in 1804. It introduced punch card technology and so it was possible to manufacture very complex patterns. 44. 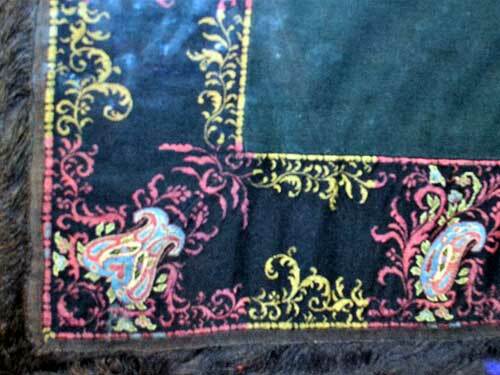 Intricate fabric design of Spaniel Dogs. 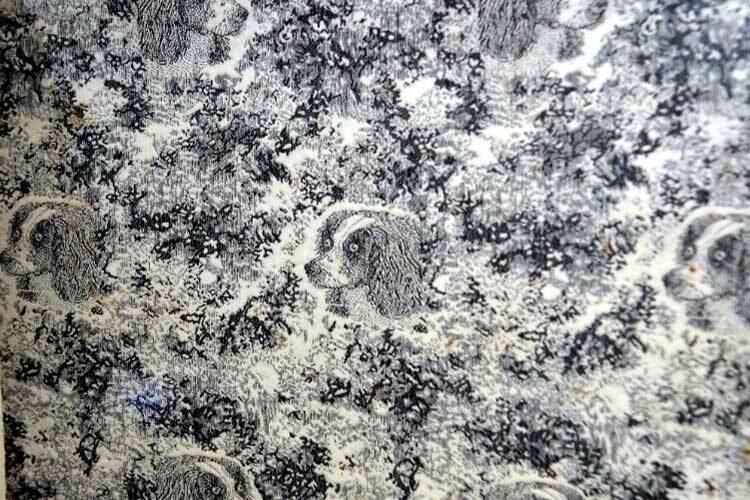 This amazing fabric was designed by William Etchells and made between 1846 and 1856. 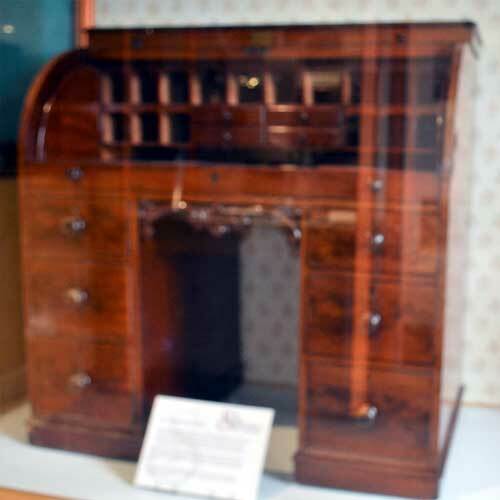 It was manufactured by George Senior & Son, Lower Mill Hill, Dalton. To be found in the Textile Machinery Room, Tolson Museum. 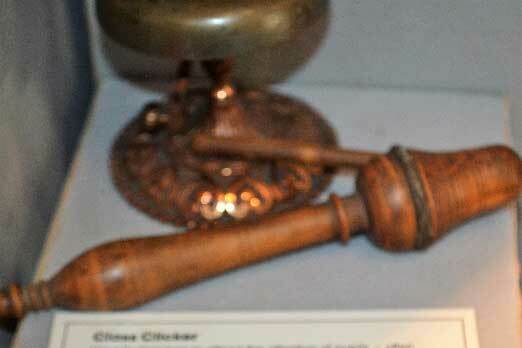 The ‘class clicker’ could be found in Victorian school classroom. It was used by a teacher to attract the attention of pupils. It was also used to let a child know it was their turn to answer a question in class. It is in the room adjacent to the Victorian Classroom in Tolson Museum. 46. Duties of the Lamplighter. 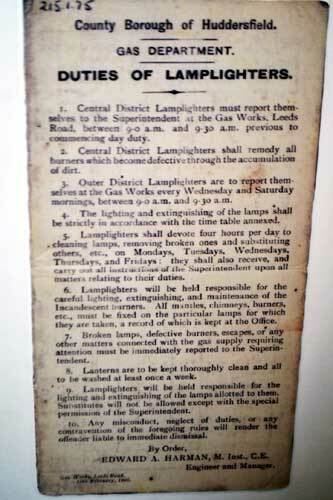 In the days before electic street lighting street lighting was intermittant and the Gas Department of the Council employed lamplighters to light lamps at dusk and to turn them off at dawn. The lamplighter was a familiar person in your neighbourhood and they were still around until the 1950s. Not only did the lamplighter light lamps but they also had to clean the lamps and report to the superindentant if there was a defective lamp. The lamplighter could also be employed as a ‘knocker up’. Details of the lamplighter duties can be found in a document in Tolson Museum. 47. Shawl with pine cones. A corner of a shawl designed between 1860 -70, woven by Joseph Farrard, a fancy waistcoat manufacturer in Almondbury. The spread of fancy cloth manufacturing spread rapidly with the use of the Jacquard loom and improved cloth dyes, made locally. The fancy cloths were produced in the Almondbury, Dalton and Skelmanthorpe areas. Textile Gallery, Tolson Museum. 48. 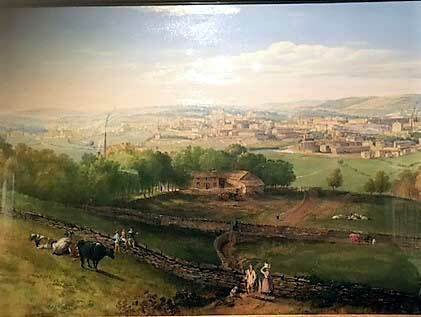 Picture of Huddersfield 1849 by William Cowen. 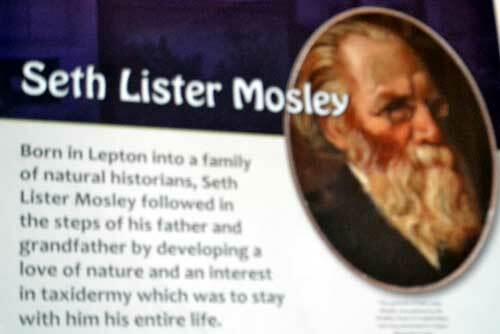 In his own words, Seth Mosley was ‘born in a museum’ and had been connected with museums all his life. He was known for his flora and fauna collection which contained over 5,000 items. He was a famous naturalist with an amazing collection of stuffed animals. He was the first curator at Tolson Museum. Bird Gallery, Tolson Museum. 50. Incorporation 1868. 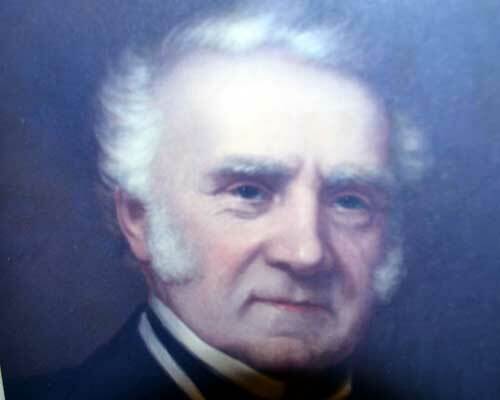 Charles Henry Jones, first Mayor of Huddersfield.